The EM Software Simulators don't allow a clear view of the real time fields and forces, i.e. action and reaction. Most part of algorithms consider instantaneous wave propagation - so action and reaction forces -, that mask the action and reaction dynamics, between the opposite cavity sides of the EM Driver, also it is not possible to distinguish phase of currents generated in the surface of the cavity. 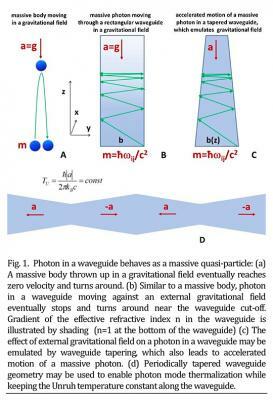 Interesting paper, suggesting phonons have gravitational mass, which might be interesting, in terms of maybe some things people think they are seeing (which might be both a real force, and/or a source of error as well....) and which might apply more to cavities filled with diaelectrics. Not only a gravitational mass, but a negative gravitational mass. The interesting point is the electromagnetic response of of EMdrive cavity, appears to remember the response of an optomechanical system. This reminds me a lot of the Podkletnov gravity impulse generator. I think I posted before that I was a bit curious if there was any validity to his claims. Imagine a sort of sound waves in the vacuum or a space time wave. I noticed that his claimed gravity impulse wave seemed to be repulsive which meant it was negative gravity and behaved like negative energy. The wild thing was he also claimed it traveled faster than light. Like 64 times c or something. Just a wild claim but was it a real observation and could it be explained. It is interesting that maybe his claim is congruent with over-inflated vacuum. In over-inflated vacuum the plank length is increased. Imagine you super-heat the air in a balloon and the balloon inflates. Its real positive energy being lost to the vacuum. Some how black holes are losing real positive energy to the vacuum also by generating gravity waves and they merge. So what about his claim of 64 times c speed of the wave. Well if you inflate the vacuum 64 times its size the speed of light should be 64 times faster. Maybe the wave isn't traveling faster than c locally but is non-locally. This is exactly what we need counter the Lorentz contraction. When the vacuum slows our time and the plank length decreases if we inflate the vacuum this creates a negative gravity speeds up time and counters the Lorentz contraction. The displacement of the pendulum seemed to be to be a temporary gravitational displacement by space possibly. The incoming wave gravitation-ally repulses on the front of the wave. As the wave passes, the pendulum experiences a repulsion from the center of the back of the gravity wave, decelerating it. In essence the center of the wave seems to have negative energy and exhibit negative gravity via the warping of the vacuum plank length,,, maybe. If there is any validity of Podkletnov's claim. edit: Its interesting that they claim such a wave might exhibit negative energy characteristics. Hard for me to really understand why it would exhibit negative energy though. Will think about it. You mention optomechanical coupling. I'm guessing your wondering at the photon gas cloud coupling. I guess you can think of electrons in a material as somewhat like gas trapped that can osculate. If so maybe a connection to negative energy there, maybe during acceleration. This reminds me of the Mach effect and modulating the mass of the electrons during acceleration. "Strong Optomechanical Squeezing of Light"
"An optomechanical system can be thought of as an effective Kerr medium, and hence ponderomotive squeezing can be understood using many of the same ideas as typical nonlinear media." "The line shape of the squeezing is not symmetric about !m in our case but instead follows a Fano-like line shape." About "Podkletnov gravity impulse generator" , if you are puting together superconductors pinned by high magnetic fields + intense currents discharges and claim gravitational effects then I would think You are speculating about gravitational anomalies linked to chiral vortical effects. If the Emdrive cavity is acting as a ponderomotive optomechanical system, then the fields may be squeezed and entangled. "Entanglement and squeezing of continuous-wave stationary light"
The videos from the Estes Park "Advanced Propulsion Workshop 2018," sponsored by Space Studies Institute (SSI) have been posted! I did not see the US Navy presentation by Dr. McDonald. Perhaps he didn't sign the release form. Can you directly calculate the sum of the electric field and magnetic field strength data on the large and small end faces? The total intensity difference of the electromagnetic field at the end face may not exceed 10%. I am not sure if FEKO can do that but I will take a look. I am curious where you get the idea that the EM-field difference between end-plates may not exceed 10%. This is the first time I have seen that. I have this data from the meep simulations I ran and I added up some forms of this data as well as animated it. What data formats does FEKO output? Experts, are you not going to continue experimenting? I feel the need to continue this business. 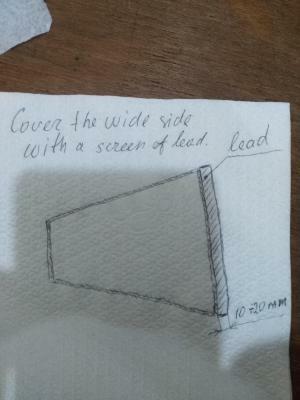 Cover the wide side of the resonator with a lead shield. Take the liberty to ask, what is your purpose? Some fresh air in propellantless ideas that may (or may not) be related to the EmDrive (explained in the following post next after this one). American physicist Jack Sarfatti (Wikipedia) has a new hypothesis for low-power warp drive. Let's sum up his ideas with simpler words, translated from his messages on Jim Woodward's email list and his other stuff gathered online (papers and videos). is a coupling constant that tells how the RHS mass-energy stress density tensor Tμν couples with the LHS gravitational field Gμν. Its value represents the strength of such coupling. Therefore, the coupling is usually very low, due to the fourth power of the speed of light in the denominator, a very large number making the constant very small. One can say that "spacetime is darned stiff". Sarfatti proposes a new way to soften the natural stiffness of spacetime with a small amount of EM energy density, enabling large spacetime distortions locally, i.e. a low-power warp drive. This is new as a warp drive would usually need (Alcubierre metric) a gigantic amount of "exotic material" of negative energy: about a Jupiter-equivalent mass. in the particular case of a local scalar field not uniform in time and space at different parts of such solid metamaterial (spatially inhomogenous & time-dependent anisotropic matter). Please note at this stage that this proposal has nothing to do with other fringe ideas involving "slow light" i.e. variation of the group velocity in some optical materials or metamaterials. Also, do not throw the baby out with the bath water yet, regarding past unhappy marriages of Maxwell with Einstein. It is true that electromagnetic susceptibilities cannot usually describe a physical response of matter, subjected to electric and magnetic fields, satisfying general covariance (which is a basic principle of relativity). Indeed, such material reacts to these fields in a non-inertial frame of reference (i.e. accelerating) differently than in an inertial frame. Consequently, those electromagnetic susceptibilities seem to not be adapted to GR, even in the case of a linear response. Warning: "Local invariance" of the speed of light must not be confused with the "global spatial homogeneity" of the speed of light in a chunk of material. A "scalar invariant" is a scalar quantity that is invariant under a specified class of coordinate transformations, which is achieved, by definition, with a tensor of rank 0, with respect to the specified class of transformations. So Sarfatti's conjecture has nothing to do with changes in the value of a constant like c within a particular coordinate system, that might result from the presence of an optical medium, or from any other physical influence such as a gravitational field. point in space – which is how Carl H. Brans defined a "locally measured invariant". That's the reason why it's important to distinguish carefully between "constancy" and "invariance" in such context. Hence, for a fixed gravitational field, when EM susceptibilities tend to infinite (i.e. in real-world when the value of Ɛ×μ becomes very large) then the mandatory EM energy becomes ridiculously low. • Balakin, A. B. (September 2007). "Extended Einstein-Maxwell model". Gravitation and Cosmology. 13(51): 163–177. arXiv:0710.0606. • Chang, T. et al. (30 August 2016). "Broadband giant-refractive-index material based on mesoscopic space-filling curves". Nature Communications. 7: 12661. doi:10.1038/ncomms12661. Moreover Jack Sarfatti's ideas, not about low-power warp drive only, but the Unruh effect too, makes him think the later explains WHY electromagnetic susceptibilities MUST be included in the Einstein field equations, and not the other way around (EFE w/o Ɛ nor μ). In return, it seems that this may also have possible ramifications (?) with Mike McCulloch's quantized inertia (and his horizon drives) as well as conical resonant cavities aka the EmDrive, when one considers filling the resonator with such optical metamaterial, instead of a gas or a vacuum, considerably boosting "thrust". Sarfatti's doesn't consider resonant cavities. His idea is that the fuselage of a spaceship should be a multi-layered 4D space-time quasi-crystal that, when externally pumped with resonant non-radiating near electromagnetic fields, would develop warp-drive function. When the pump is switched off, the material goes dormant. "Near electromagnetic fields" are Glauber coherent states of virtual photons with three polarizations (not the usual two of transverse far-field electromagnetic radiation). In classical vacuum, only the virtual electron-positron pairs matter. However, Einstein's Equivalence Principle, that predicts both real and virtual charges, will contribute to the way matter back reacts on space-time geometrodynamics. By the way, this is also related to Dark Energy. Therefore, off mass shell virtual photon resonances in the material will lower the near field analytic continuation of the far-field speed of light. This softens the space-time stiffness barrier G/c(헸,f)⁴ in the NEAR EM FIELD 4D Fourier spectrum, allowing low power weightless warp-drive on-board steering of the timelike geodesic path of the spaceship. Properly accelerating non-inertial frame detectors see real particles ("hot bath" seen by an accelerating observer). But 'same' particles are virtual zero point seen by a locally non-accelerating inertial detector (nothin seen by a distant observer). Why? Because the EM 4-force needed to push the non-inertial detector off a free-float timelike geodesic does work W on the vacuum. Therefore, the local Einstein field equation is only generally covariant when both matter and vacuum indices of refraction n(헸,f) are included inside matter… QED. So low-power warp drive is possible when there are large resonant index n peaks in the off-mass shell ck/n(헸,f) ≠ f near EM fields in the source stress-energy Tμν, where f ≈ 0 and 헸 ≠ 0 for static near fields. Following this idea, it is very interesting to read the following recent preprint by Igor Smolyaninov, a physicist specialized in optical metamaterials working at the University of Maryland, Baltimore. He independently makes roughly the same prediction, using completely different model and hypotheses. The author predicts that the usually extremely tiny hence quasi undetectable Unruh effect could become very large, depending on the gradient of the refractive index, so depending not on n ≫ 1 (as Sarfatti conjectures) but on dn/dz ≫ 1. • Smolyaninov, I.I. (November 2018). "Giant Unruh effect in hyperbolic metamaterial waveguides". arXiv:1811.08555. In this scheme, the electric permittivity Ɛ and the magnetic permeability μ gradually change as a function of z-coordinate inside the optical metamaterial filling the resonant cavity. This does not only goes in the exact same direction as Sarfatti's Popper-falsifiable idea about an anisotropic metamaterial in the shell of a low-power warp-drive spaceship. Indeed, Smolyaninov's proposal to use a truncated conical resonant cavity filled with some metamaterial instead of air or a vacuum, in order to considerably enhance the Unruh effect, is shockingly reminiscent of the EmDrive being precisely a resonator with a frustum shape on one hand, but also connecting the dots on the other hand, for its alleged propellantless feature when considering McCulloch's conjecture that RF resonant cavities are in fact "horizon drives" using such asymmetric Unruh waves pushing on matter (through its whole volume, not only just on its surface like photon radiation pressure). According to all these ideas, an anisotropic metamaterial filling the EmDrive would considerably enhance its thrust. • McCulloch, M. E. (May 2017). "Testing quantised inertia on emdrives with dielectrics". EPL. 118(3): 34003. doi:10.1209/0295-5075/118/34003. At the recent workshop he attended in Albuquerque, he was suggested to test as well, on the contrary, Epsilon-Near-Zero (ENZ) materials, i.e. materials having an electrical permittivity (and/or magnetic permeability) approaching zero. I do not especially endorse these developments, nor I am able to prove/disprove them. But maybe you'll be interested in the reading, and that some of the specialists here can discuss the validity of such innovative ideas. So where is this testable claim you mention? A high index of refraction material having a high index of refraction is a tautology. The relationship between the speed of propagation of light in a material, the permittivity and permeability of the material, and the index of refraction is not new physics, it is well known and tested. I could try to explain why claims like this that try to couple electromagnetic material properties into modifications of the fundamental constant c indicate an ignorance of why "c" appears in the GR equations, and the physical origin of the electromagnetic material properties. I'll just point out that permittivity and permeability aren't single numbers in general, in part due to frequency dependence, and the actual results of these kind of predictions would probably result in materials either being much lighter or heavier than otherwise depending on their permittivity, if the people proposing them actually ever worked out the real consequences of their claims. I had a slightly different question: What is this "special material"? If it cannot be found, then it cannot be tested nor falsified. If you don't mind explaining this "coupling" briefly that would be helpful to me and maybe a few others. Just because light is a mite slower in glass doesn't mean that the fundamental constant of c has changed. BTW, I remember a sci-fi story where they had a "special material" such that in an inch thickness of the material, it would take light some ten years to travel thru. They would put slabs of this material on mountain scenes, or jungle scenes or beach scenes for ten years, and then sell the slabs as a sort of teevee. You could have a "living" television in your room that showed an everchanging natural environment. I thought that it was a great idea. From Mike McCulloch on twitter below. Would be interesting to see this 6.5 sigma data and the test rig. Yes. The thrust is tiny (1 microNewton) but, if it is real, then it is scale-up-able. Were the constant, c, equal to the speed in the medium, then Notsosureofit's Hypothysis would have given the maximum force achievable (approximatly) Given that at the time, claimed results were much higher than reasonable experimental maxima today.....easy enough to increase the cavity filling index in that calculation but (without doing it) I suspect that the change in cavity dimensions for a given mode may cancel it out. Now Jack Sarfatti is reputed to have a history of brilliant speculation in the matter of physical phenomena, albeit without much in the way of concrete results, at least in as much as has been released and that I am personally aware of. I think previous comments have pretty well summed things up. I am assuming this question is directed towards flux_capacitor. I agree with you so I can't answer it. Probably off topic, but that is quite an interesting idea. Due to the extremely high refractive index involved path length should be close to the same from all angles, but looking from near the edge should make you look farther back into the past. You could probably design a curved version that intentionally has a time gradient across the observed image. I can think of a lot of applications for such a material. Later on, a novel book by Stephen Baxter & A.C. Clark was great. Mods: Delete if you see fit.